Healthy aloo poha can be served for breakfast and also it can be served as an evening snack or tea time snack. The vegetarians have this as a brunch. 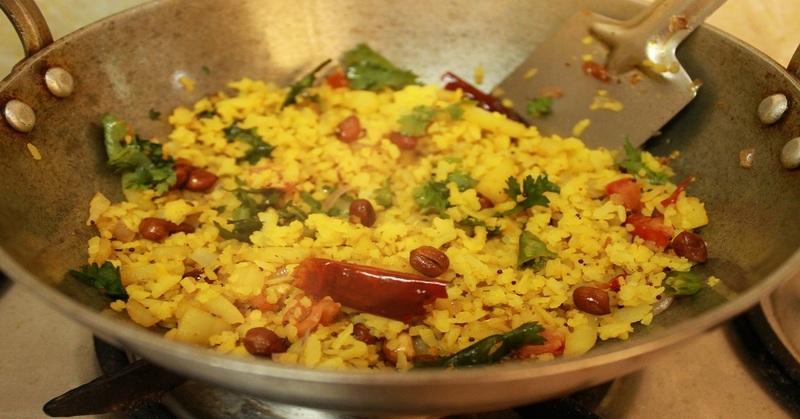 Rice is a very source for carbohydrate and so is poha since it is made up of rice. There are different types of poha and rice poha is very healthy and easy to make. You do not need to spend much time for preparing this and you do not need many ingredients too. A few ingredients and following the direction given in the aloo poha recipe will be more than enough to make a delicious yummy food. Aloo poha is a perfect brunch or breakfast food that is healthy, nutritious and at the same time very healthy too. This is good for toddlers too. If you are tired of cooking very complicated recipes and dishes, and if you want to take a break and at the same time serve yourself with an easy and yummy food then this is the perfect one for you. Try the healthy aloo poha recipe and you will love it till the last bite on your plate. Take a pan and heat oil. Add mustard seeds and cumin seeds into it. Let it splutter. Add onions and potatoes to it. Saut until it becomes golden brown in color. Add tomatoes and saut again for five more minutes. Now add chilli powder and turmeric powder to it. Add rice flakes and mix it thoroughly so that it mixes well. Now close the pan and let it cook for another 2 minutes. Serve hot. You can garnish it with coriander leaves. Aloo poha is ready to eat. Enjoy this in breakfast or brunch. Aloo paratha is an Indian and Pakistani recipe and one of the most popular breakfast throughout the western, central and northern regions of India as well as Pakistan.